There is nothing like having beautiful and inviting tiled outdoor spaces around your home. 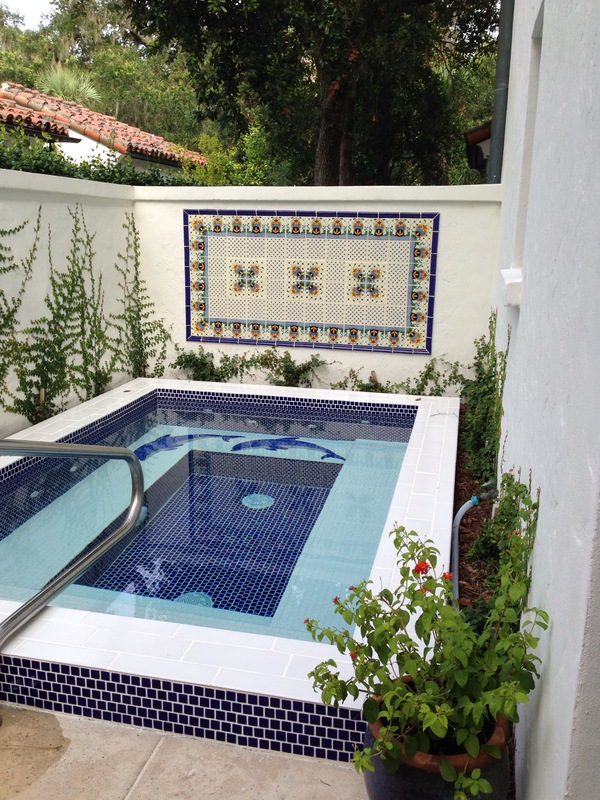 Have you dreamed of using beautiful, colorful Mexican tile in your swimming pool, spa or fountain but are afraid to because you live in a cold climate that freezes and thaws in the winter months? Or perhaps you would love to create an inviting outdoor kitchen, barbecue, stair risers or patio space using Mexican tile, but have the same fears. Use ceramic Mexican tile for outdoor projects in warm climates and porcelain Mexican tile for cold climates. Ceramic Mexican tiles are fired at high temperatures and are absolutely fine for swimming pools and fountains in mild climates where there is no danger of freezing. Again, don’t be misled by claims of tile being “frost-proof”. Even ceramic tile will over time, absorb water and if allowed to then freeze, it will crack. It will NOT crack if it does not freeze. Only porcelain tiles should be used in climates with frost risk. Our entire Ceramic Especial Collection can be made into Porcelain. Porcelain Mexican tile are fired to extremely high temperatures to achieve a truly waterproof tile. Porcelain is not affected by freezing temperatures and can be used in any outdoor tile project including swimming pools, spas and fountains. Expect to pay more for a porcelain tile, the peace of mind is well worth the price. Some colors and very finely detailed designs don’t translate well into porcelain. You also cannot get a matte finish in porcelain. What you DO get is beautiful outdoor tile and peace of mind. 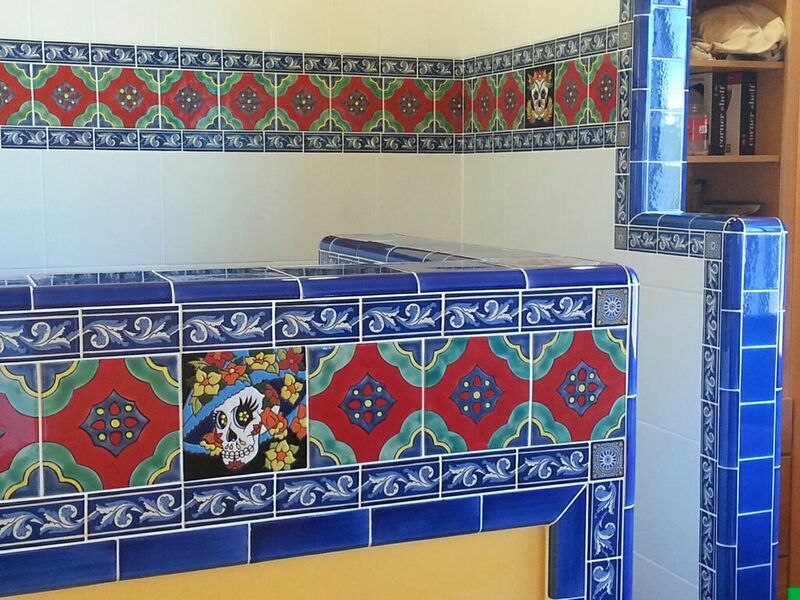 Think of all the ways you can enhance your outdoor living spaces with bright, exciting Mexican Tile! 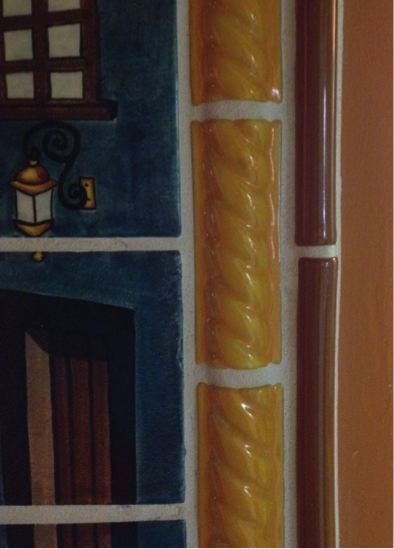 Here is an example of front door trim using Mexican tile. Also consider planters, window trim, patio walls and more. 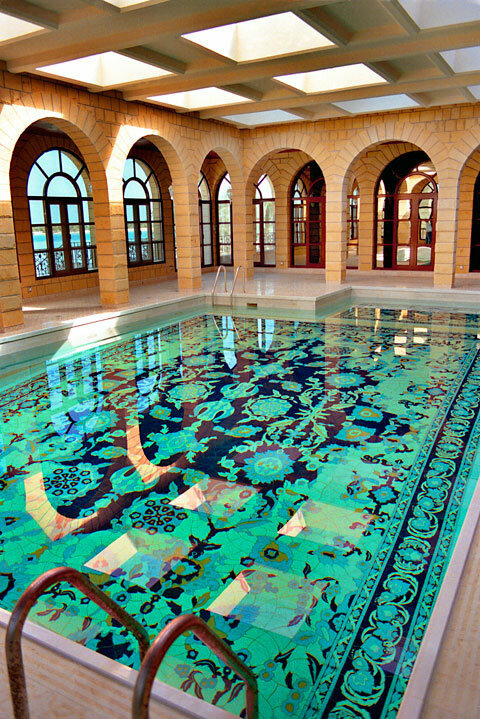 Who said all pools and spas have to look the same and all the tile be a single drab color? Why not use Mexican pool tile to make an extraordinary pool like no other that reflects your own sense of style and fun? Ceramic or Porcelain Mexican pool tile at the waterline and on steps and benches, adds a dramatic and exciting line of color and design. You can make it as simple or complex as you’d like. Talented Mexican Tile Designs staff are happy to help you with free design and planning help. Ceramic Mexican pool tile is best used in warmer climates that never freeze, while porcelain Mexican pool tile is ideal for cold climates. 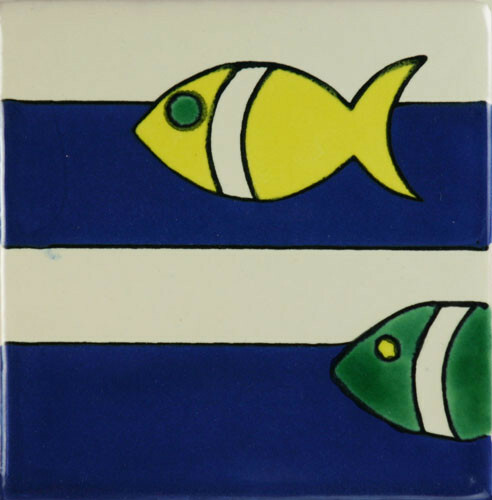 The entire Mexican Tile Designs pool tile collection is available in both ceramic and porcelain. Don’t forget to add flash and flair around the pool as well on walls, planters and outdoor kitchens. 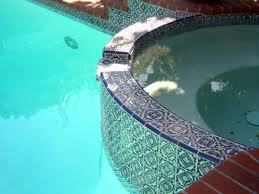 Call toll free 866-320-1628 or email info@mexicantiledesigns.com today to discuss your pool project . Do you want your pool or spa to be extraordinary? Are you tired of pale blue and beige? Do you want to incorporate color and design and creativity into your pool? 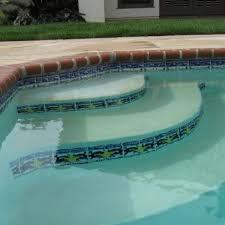 There are hundreds of beautiful tiles at Mexican Tile Designs that can add brilliance to your pool waterline, to pool steps and to pool enclosure walls. You want to be sure to use CERAMIC tile, not red-clay tile for a pool, as ceramic is fired at high temperatures and is much more durable and does not absorb moisture like red clay does. If you live in a climate where the weather fluctuates between freeze and thaw in the winter—you may need porcelain tile. Give the friendly folks at Mexican Tile Designs a call today at 1-866-320-1628 and let us help you create the SPECTACULAR pool of your dreams! Look at these examples and then imagine YOUR amazing new pool! Are you building a new home or remodeling an existing home? NOW is the time to start thinking about tile! You don’t want to compromise on your dream design because a harried contractor is running out of time! Mexican Tile Designs has an enormous inventory of solid and decorative tile, trim tile, murals and sinks in stock, but if you are planning to use tile throughout your home perhaps including: a kitchen counter and backsplash, bathroom counters, backsplashes and tub/shower surrounds, stair risers, wainscoting, window trim, door trim or other decorative features; it is best to start planning well in advance. Mexican tile is hand made in small batches. Often times when we order tile throughout the year, there are slight variations in the color and finish. This can become a challenge when tiling a large area. There could be small variations in the tile if they do not come in the same batch shipment. Our advice is to order all of your tile for large areas at one time. This ensures consistency with the tiles. We’re not talking about the tile around your beautiful Mexican sink…we’re talking about the design. Give yourself plenty of time to do all the design planning necessary to fully realize your vision. Then once you come up with your design, you should take a little time to think about how it will look and feel. Environmental conditions like sunshine and seasons can change the appearance and mood of your design. Get advice from your contractor and the experts at Mexican Tile Designs. Our design staff has helped 100’s of homeowners, restaurants, five star hotels and even celebrities with their tiling projects. One of the biggest challenges contractors face is timing a project. Delays in materials can throw a wrench in the process and cost significant amounts of money and delays in your schedule. Make sure to order your tile well in advance of the date it is needed on-site. Work with your contractor to make sure the materials arrive when they need them. Better that your tile is at our warehouse ready to ship than waiting for our Mexico suppliers to make it. It is industry practice is to order 5-10% more tile than actual dimensions may require in order to accommodate cutting and any incidental breakage. 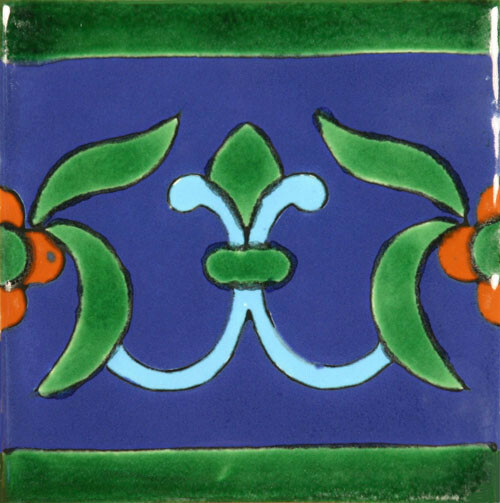 This is especially true of Traditional red clay Talavera tile. When using ceramic tile, 2-5% extra is usually sufficient. It’s also a good ide to put a few tiles of each color and design safely aside in a cupboard or closet on the rare chance one later breaks. It may be hard to replicate that tile years or decades later! Best of all, we offer significant discounts for multi-room or whole house projects! Call for details. 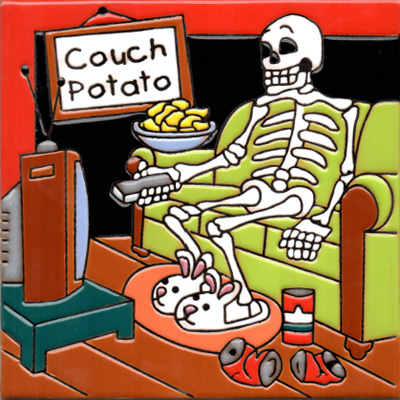 *Save money on quantity discounts: additional discounts for whole house/multi-room orders! 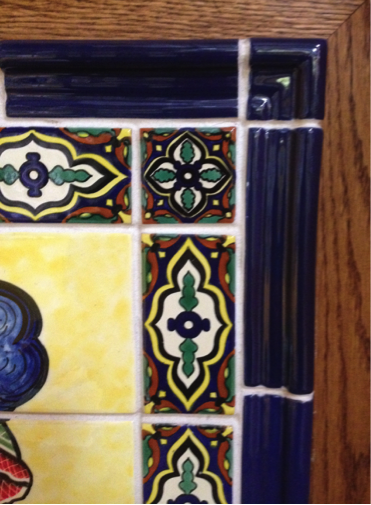 When you think “Mexican Tile”– it’s time to think globally! 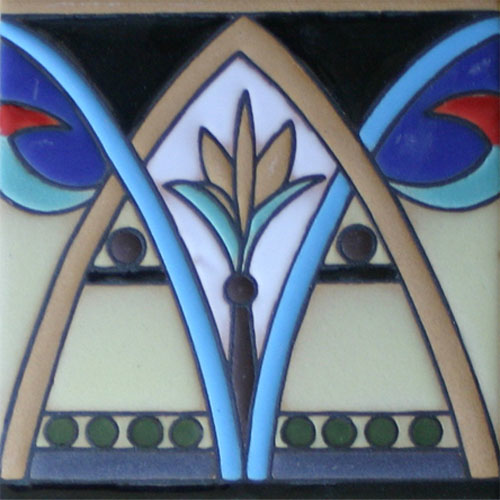 Over the last one hundred years Mexican tile has grown beyond the early Aztec, Mayan and Majolican designs of the late 1800s and early 1900s to incorporate truly global designs. 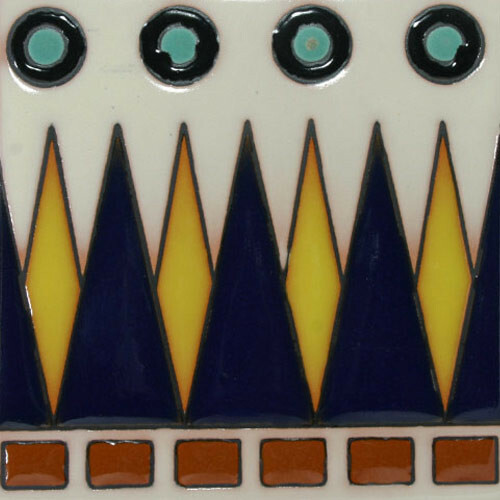 Ancient designs have been interpreted with modern and even oriental flair as evidenced by the work of renowned Ceramic artists Ken Edwards and Gorky Gonzales. 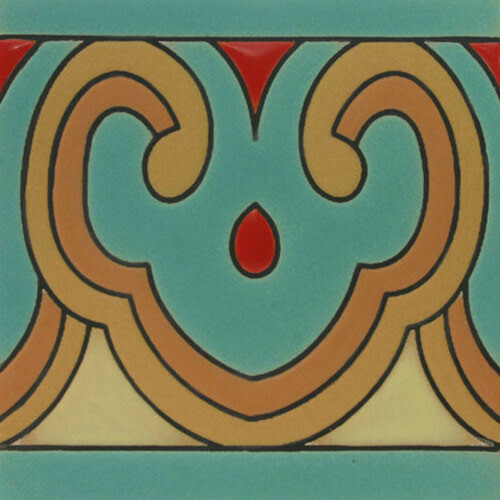 We have a decorative tile in just the right color and design for your project. In contrast to the monochromatic , bland look popular in the last few years as evidenced by fads of travertine and granite, these global tiles will bring color, creativity and vibrancy into your home. Please give us a call for complimentary design help! 866-320-1628 or email: info@mexicandesigns.com and let us help you make your dream come true. Give your staircase a New Year’s makeover! A staircase is just a way to go up and down unless you make them EXTRAORDINARY using decorative Mexican Tile on the risers (the vertical portion of each step). You, too, can have a unique, colorful and exciting staircase! Yours can totally reflect your own tastes and creativity. The cheerful, helpful team at Mexican Tile Designs can help. Just call us! 866-320-1628. TIP: most stair risers accommodate a 6” tile, but remember that a 4” tile set “on diamond” is also 6”! Then you can cut solid color 4” tile into triangles to fill in the spaces between the decorative tile. Many stair risers are more narrow, where a 4” tile will fit just fine. If a 4” or 6” tile doesn’t fit your risers, Mexican Tile Designs also has custom sizes available, so you can order a size that fits perfectly. Choose from three different lines of tile, each unique with a different price point so you are sure to find something that fits both your taste and your budget. If you have a lot of stairs, look for quantity discounts. 1. 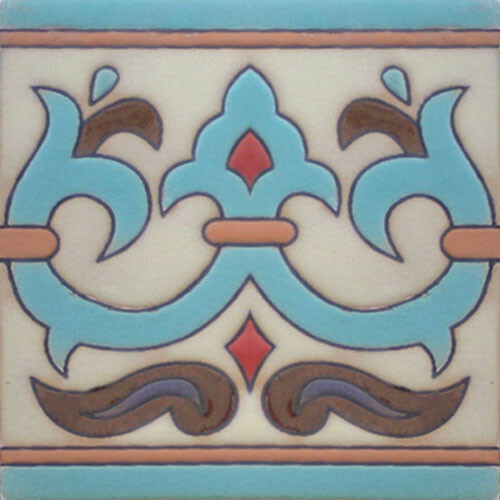 Traditional Talavera red clay Mexican Tile: rustic, beautiful, less expensive, this tile has been used for centuries to bring Spanish influence, color and excitement to staircases, backsplashes, bathrooms and more. For stair risers, people often choose within a theme, such as: blue and white, fish, birds, or a mix. You CAN have spectacular steps, whether it is two steps going into the kitchen or 15 steps going up to the bedrooms. Beautify your steps today! Call us toll free to help! Mexican Tile Designs 866-459-4305. 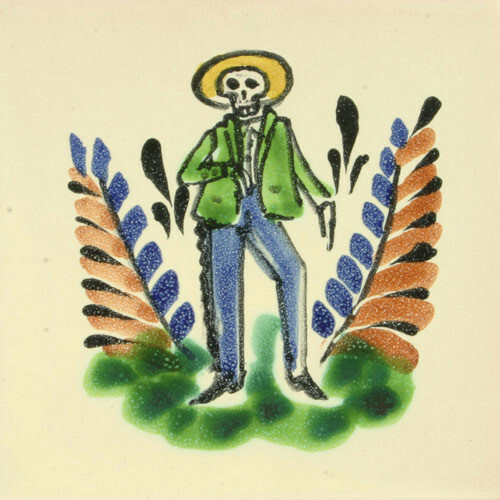 Colorful Day of the Dead tiles make great gifts! 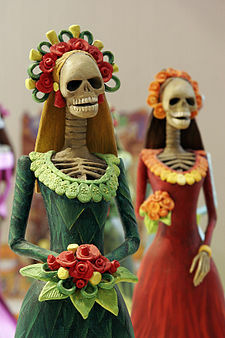 The Day of the Dead or Dia De Los Muertos is a Mexican holiday celebrated throughout Mexico and throughout the world on October 31, November 1 and November 2. 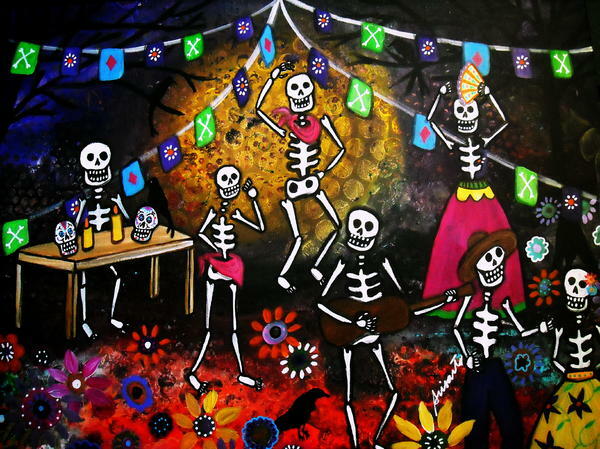 In Mexico it is a day to honor and celebrate your ancestors with music, food and festive decorations. 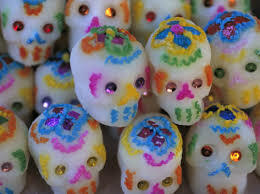 In the US, the Day of the Dead is usually celebrated in conjunction with Halloween. 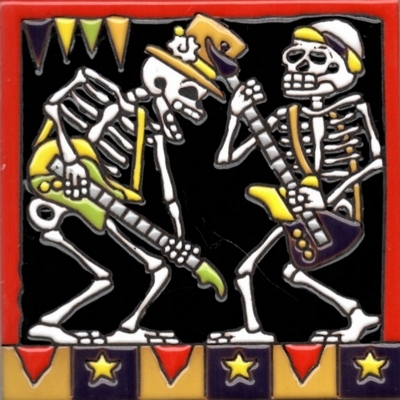 Day of the Dead decorations, including tile, has seen a huge growth in popularity in the US, probably because of its fun colorful designs and funky stylish look. 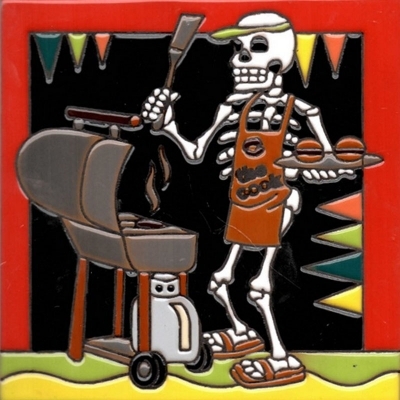 Day of the dead tiles are now found all year round in homes and businesses across the country and world. 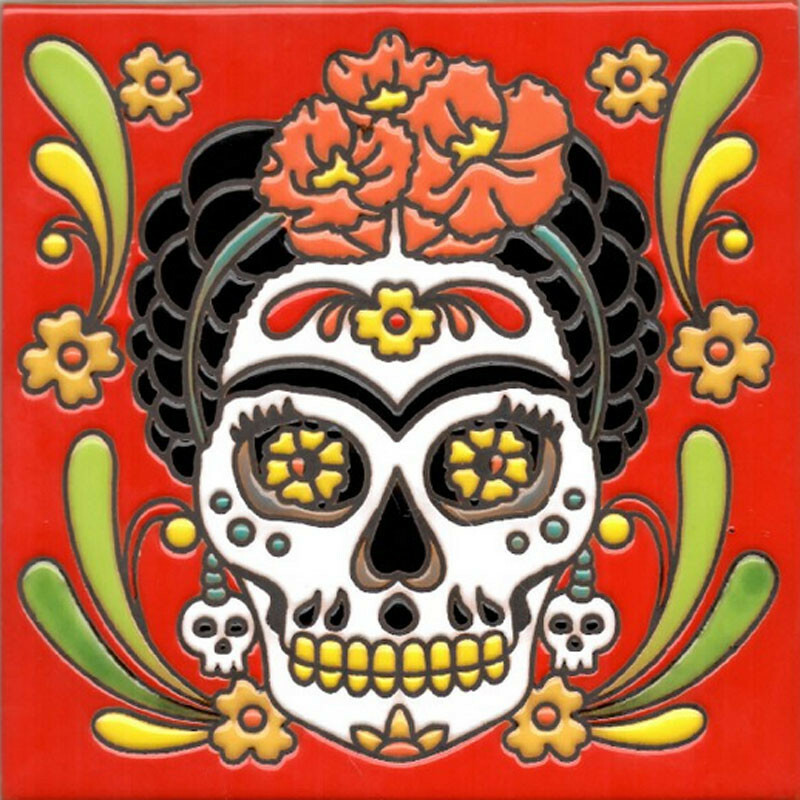 Mexican Tile Designs carries over 50 bright, bold, colorful raised relief ceramic tile Day of the Dead designs! These make perfect gifts as you are sure to find one for anyone you on your list. Do you know a golfer, a gardener, a skier or mother? Perhaps someone who loves baseball, or basketball, cats or watching TV? 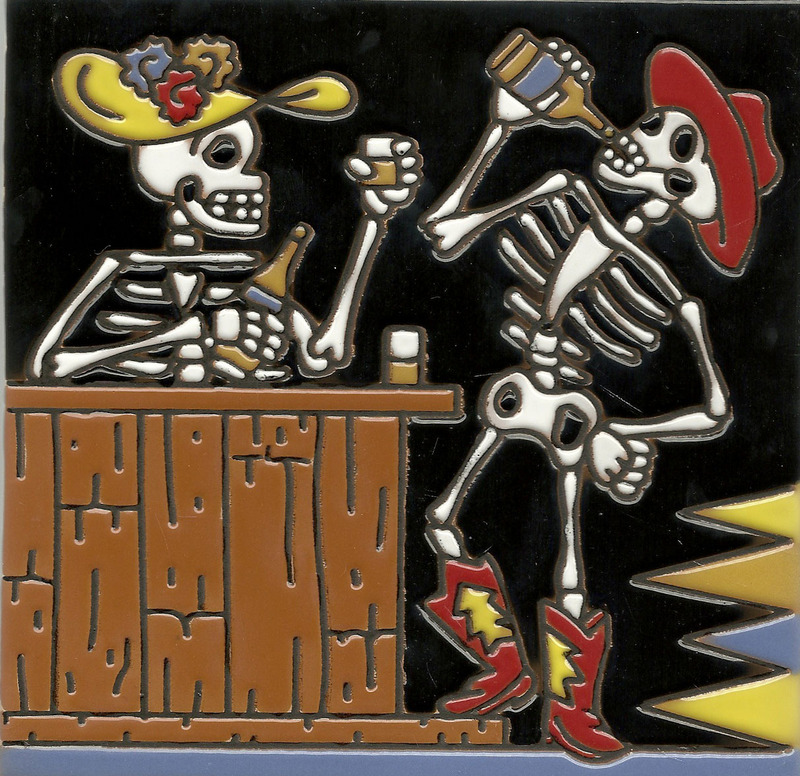 There is a Day of the Dead skeleton tile just for them! 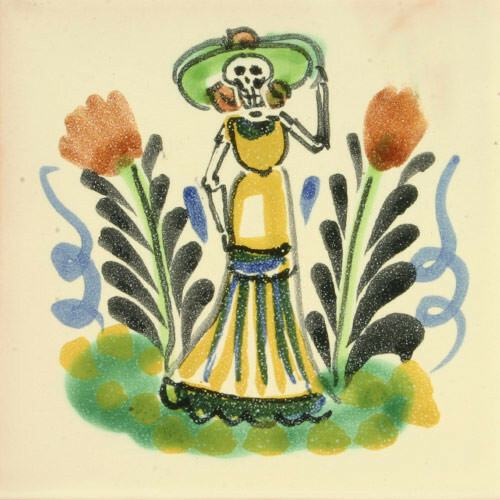 In addition to the large 6”x6” raised relief Day of the Dead tile, there are also ten beautiful tiles featuring Day of the Dead figures by renowned Mexican ceramic artist Gorky Gonzales. Here are just two examples! 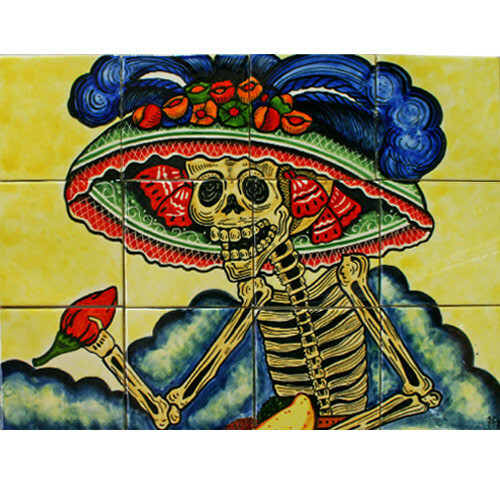 Or think of where you can put a wonderful Dia De Los Muertos tile mural featuring a Day of the Dead Catrina holding a chili pepper! It may be just perfect for your patio, rec room, or even your tub surround! At Mexican Tile Designs, we’re always available to help with design ideas, tile calculations, installation tips and more. Give us a call toll free at 866-382-1628 or email: info@mexicantiledesigns.com. Many pools are just plain boring when they don’t have to be! You don’t have to settle for a typical and factory-looking pool, instead use beautiful Mexican solid color and decorative tile to make your pool truly dazzling. Here are just a few ways to create a one-of-a-kind pool that truly reflects your unique personality and taste. 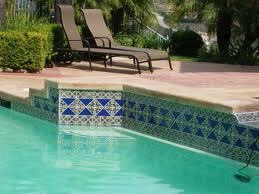 Use decorative tile or border tile on the pool stair risers. 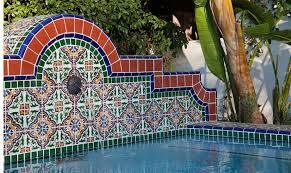 Use a Mexican tile MURAL on the pool wall or floor. Give swimmers something fun to explore underwater! This example uses a tile “rug mural“! 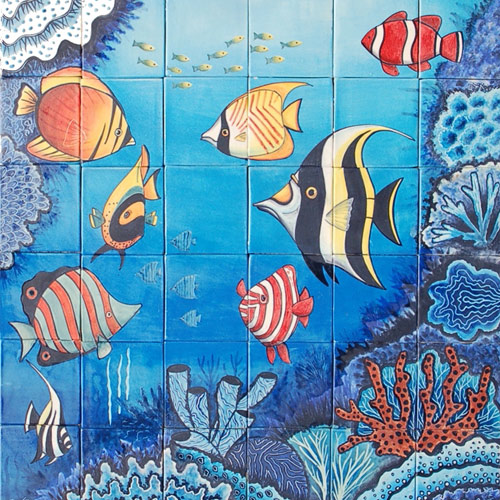 and this underwater fish mural is sure to delight children and adults alike! 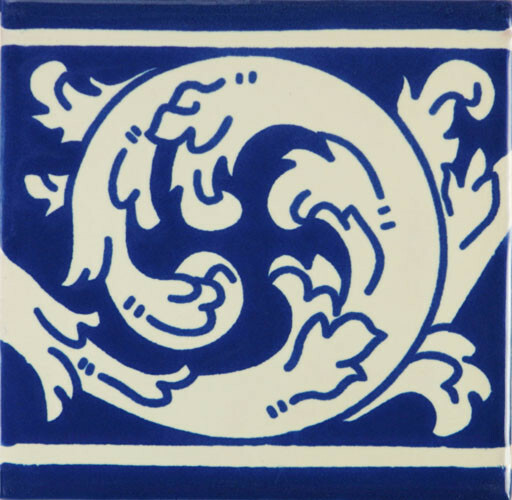 Perhaps, you’re thinking, “Mexican tile wouldn’t hold up in a pool!” That may have been true of the original colonial red clay Talavera tiles. But modern Mexican tile comes in high-temperature fired ceramic, and if your contractor insists on using porcelain, not a problem! Most of our Especial and Prima designs (except washed colors and Matte finishes) are available in porcelain as well. Remember we also have gorgeous solid color tile to match any selection you make. 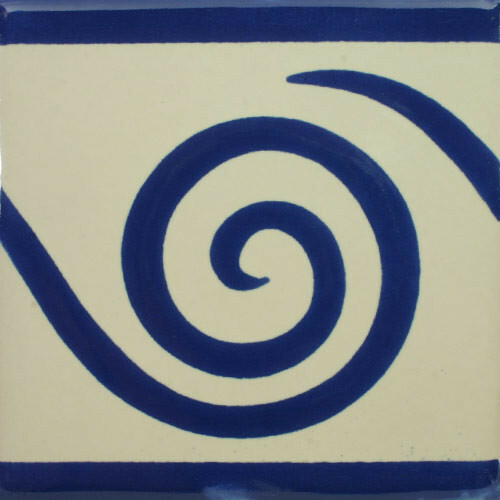 See our complete selection at www.MexicanTileDesigns.com to find the perfect Mexican pool tiles for your pool, spa or fountain! Call or email us for free design help or with any questions you may have. There is nothing quite so jaw-dropping beautiful as a well-placed Mexican Tile Mural. Whether it is on your kitchen wall, your outdoor patio wall, or even in your shower, it will always impress! 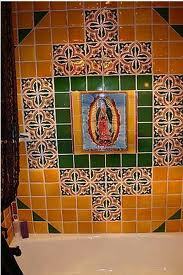 Here is an example of a Madonna mural surrounded by solid color tile and decorative Mexican tile on a tub surround. 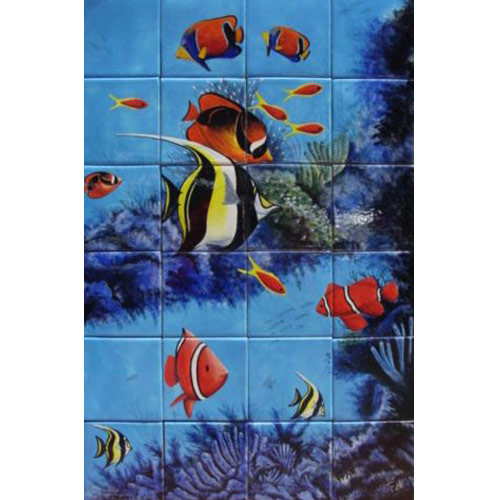 Mexican Tile Designs carries over 70 hand-painted ceramic TILE MURALS that feature everything from floral and fruit still lifes, to village scenes, to magical underwater scenes. Alternatively, your can create your own mural using a combination of decorative patterns, border designs, trim tile and solid color tiles. 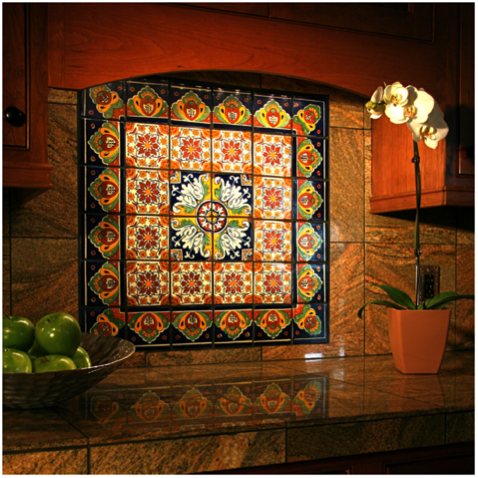 Here is an example of a Decorative Tile Mural placed above a kitchen countertop. 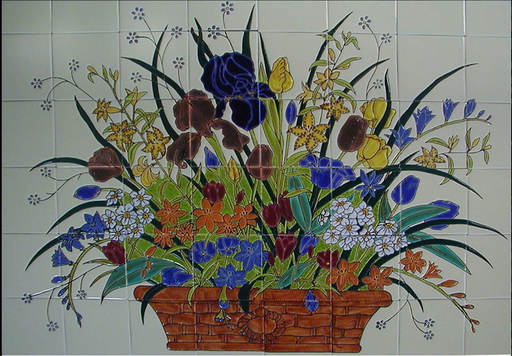 A tile mural can be set directly onto a wall, into stucco, or even on a framed board that can be moved. One key to a beautiful mural is to use Decorative Border Tile, usually consisting of 2”x 4” tiles around the outside edge to enhance and frame the mural. 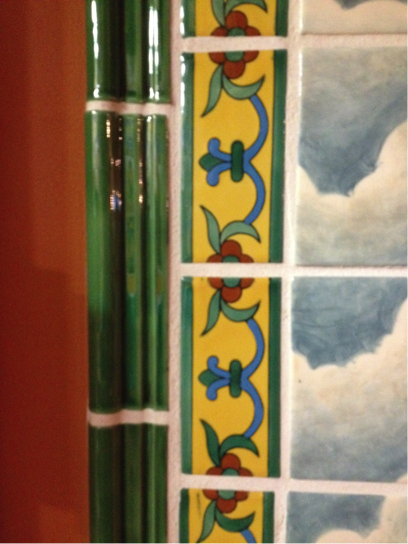 Next use a TRIM tile, such as Corniza, Braid trim, or pencil trim in complementary colors to complete the frame effect. You can even use several types of trim tile to further draw the eye to the mural. Mexican Tile Designs provides free design help to insure that your tile project turns out exactly how you dreamed it would be! Please call us toll free at 1-866-320-1628 or email us at info@mexicantiledesigns.com . 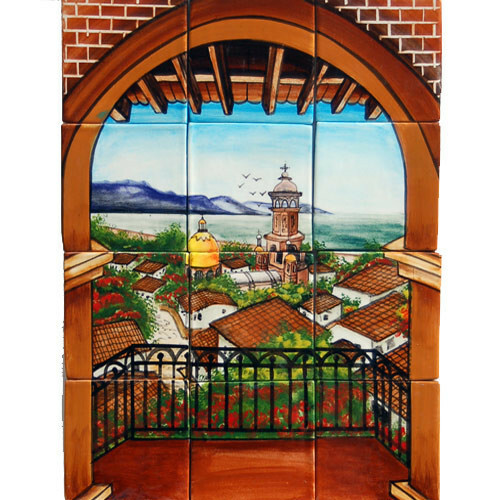 Remember Mexican Tile Designs also offers FREE SHIPPING on all pre-made murals within the continental U.S.!